Russ Cox of Google has been credited with finding and reporting a kernel level bug to Apple, which has since been patched with yesterday’s release of iOS 11.2.5. Now, according to Cox himself, he has full intentions to release the kernel bug into the public domain, which could lead to the creation of an iOS 11.2.1 jailbreak if exploited. As you may already know, Apple recently released iOS 11.2.5 to the general public, which was inclusive of a number of fixes and improvements, such as bringing HomePod support in anticipation of next month’s release, and additional power for Siri in the form of being able to offer news broadcasts. 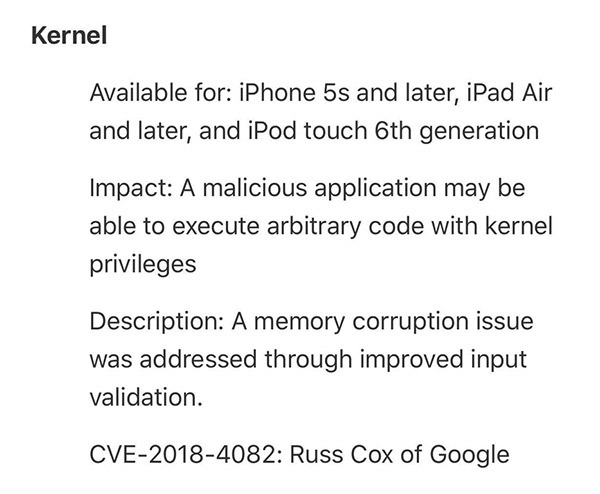 As part of the security updates in that build, Apple’s security information confirmed that a kernel level bug had been patched, under the ID CVE-2018-4082, credited to Russ Cox of Google. From an impact perspective, the information suggests that a “malicious application may be able to execute arbitrary code with kernel privileges” in the bug was exploited correctly. In response to a direct question on Twitter, Cox has taken the opportunity to confirm that he will be releasing the kernel level bug into the public domain and that he will “tweet a link” to the aforementioned release when it has actually happened. Obviously, as it stands at the minute, the bug has only been shared with Apple and likely a few select colleagues within Google. There is also no suggestion that Cox has taken this beyond the bug stage and actually put together an exploit which uses the bug in a fashion that those involved in the jailbreak community would want or require. The jailbreak community will, however, want to take a positive viewpoint on this development. It’s now public knowledge that a known kernel level bug does exist with iOS 11.2.1, which means that the community will be quietly hoping that someone can take Cox’s initial work and use it to their advantage to potentially put together a jailbreak which allows 64-bit devices running iOS 11.2.1 to be liberated from Apple’s walled garden. As soon as Russ Cox decides to release the bug, or more information is known on this matter, we will be sure to bring is straight to you. 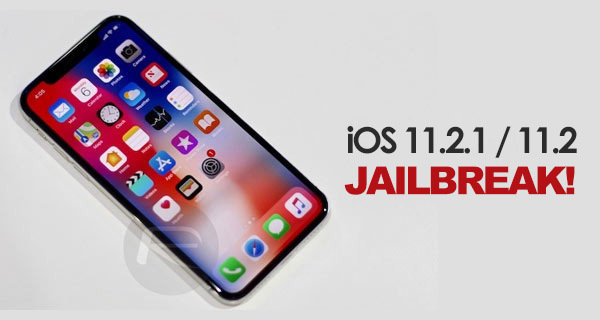 In the meantime, just to be on the safe side for any future jailbreak, you may want to avoid iOS 11.2.5 for the time being and stay on iOS 11.2.1 just to see how this one develops. Also, iOS 11.2.1 is still being signed in case any of you want to downgrade to it. So do we move from 11.1.2 or move to 11.2.1 before the window shuts? Becoming a hoop jumping malarkey. Always stay there, where a jailbreak exist. Stay on 11.1.2. You’re just waiting for Saurik to finish Substrate. 11.2/11.2.1 may not happen. Is this exploit valid for the ios 11.2.2?? Or downgrade at 11.2.1? Downgrade! It’s only to 11.2 and 11.2.1. Bug has been patched in 11.2.5 but can’t be exploited in 11.2.2 ?!?!?!? Looks like we may be good at 11.2.2… Crossing fingers!!! Are you guys sure for this “Exploit”, both 11.2 & 11.2.1 are valid? I just bought an X and it’s on iOS 11.2! Just double checking but have iphone x on 11.2 should I stay put. I hope you’re right. That’s what I’m on. What firmwares does the exploit apply to? only 11.2 and 11.2.1? A question; I’m on iOS 11.3beta, I have a choice to downgrade to 11.2 or 11.2.1. Which iOS is more stable both jailbreak wise & speed and performance wise for iPhone 6S? This needs to be corrected or clarified in the original article. I was on 11.2.5b thinking I will not be getting a JB anytime soon. After this news I have downgraded to 11.2 and hope JB will be released soon. So tempted to try out CarPlay tweak. It’s safe to move back to 11.2 ASAP.. I did it yesterday. None of it even matters until someone makes a friggen substrate that works! Hi, my ipad air is still on ios 8 with jailbreak. should I move to ios11?